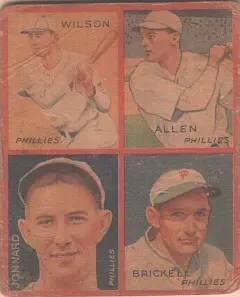 I picked up four 1935 Goudey cards in one swoop–something I don’t expect to repeat many more times while still buying locally–but I’ll write about the cards one at a time, starting with the cheapest card, which had an unexpected personal meaning, especially given that it contained no Hall of Famers and portrayed four Philadelphia Phillies players. Dad was from Pennsylvania, but he rooted for Philadelphia’s other team, the Athletics. That card portrayed Ethan Allen, Jimmie Wilson, Fred Brickell and Bubber Jannard. Ethan Allen created a popular board game after he retired called All-Star Baseball. Each player in the game had a disc that you put into a spinner to determine the outcome of an at-bat. If you spun a “1,” it was a home run. Needless to say, Babe Ruth’s “1” slice was a lot bigger than U.L. Washington’s “1” slice. It was an ingenious way to create a realistic baseball simulation without a computer. I played a lot of All-Star Baseball with my friends growing up. And it just so happens that in 1935, Ethan Allen had a good year and hit .307. As best I can tell from his statistics, he was a talented player who had trouble staying healthy, but if he managed to stay healthy and play 100 games, he’d hit close to .300. But he’ll always be better remembered for his board game. Jimmie Wilson was a two-time All-Star catcher for the Phillies, and 1935 just happened to be the second of those All-Star appearances. His last hurrah was 1940, where he only played 16 regular-season games at the age of 40 but played in six games of the 1940 World Series for the Reds. It’s good to go out on top. He was the only one of the four players on this card to ever be a serious Hall of Fame candidate, but never received more than 8.8% of the ballots. Fred Brickell was an odd selection, given that he’d last played in 1933 and only played in 8 games that season. The thing to remember with American companies in the 1930s was that economics played a part in every decision, and the 1936 set re-used the artwork from the 1933 and 1934 sets. They had the Brickell drawing, so they used it. He was an outfielder who’d had a shot earlier in his career as a regular, but was always more productive as a backup. He played his entire career with the Pittsburgh Pirates and Philadelphia Phillies. Bubber Jannard was a backup catcher who played a single game in 1935, but hadn’t appeared in the majors since 1929 prior to that. He had a longer and more productive career as a coach and scout than as a player. His twin brother, Claude, was a big-league pitcher from 1921 to 1929. His inclusion was another oddity, given that he was an obscure player even in 1935 and hadn’t appeared in an earlier Goudey set. Perhaps they’d signed him and had the artwork and just hadn’t ever issued it before. Rounding out sets with marginal players was par for the course with Goudey, and for some collectors, figuring out who these players were is part of the fun with these Goudey sets.